The last few days warm temperatures and rains have encouraged the zoysia grass and at the same time have awakened our bermuda grass, some which was dormant and some was chemically injured last fall. 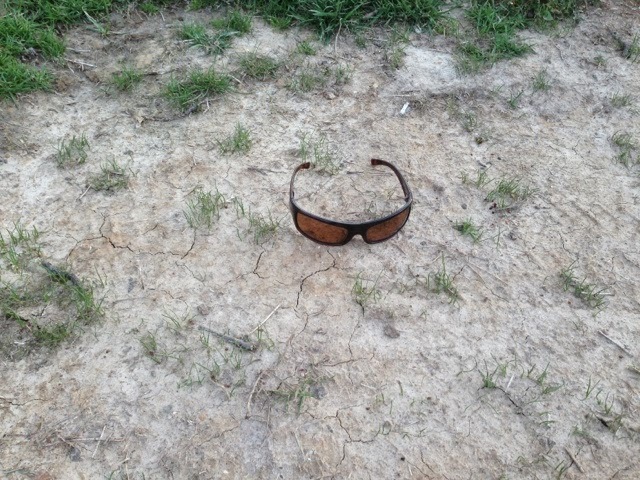 A majority of the chemically injured spots are beginning to see plants emerge out of the ground. I made a couple of videos discussing the progress and give you some additional details on what you are seeing in our warm season turf. I would expect very soon you will be seeing some large patch on both the zoysia and bermuda grass. Air temperatures in the mid-70's and wet conditions contribute to this disease beginning to expand. In most cases, the 3rd to 4th week of April are prime times for disease to begin to be seen. Also, a reminder about the Eagles at Harrison Bay, they are getting really big! 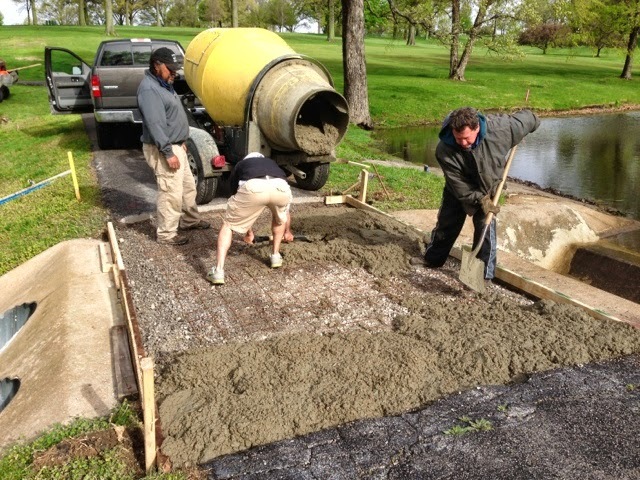 Wet course after overnight rains but there are always projects that must be accomplished. Learn to be flexible. The staff put almost 2 yards of concrete to cover the spillway to 15. Finished picture tomorrow. Contractor came in and ground our final 5 stumps today. Began the clean up. Hope to back fill with soil and sodded within 7-10 days. Staff cleaned up the long range walk path today. 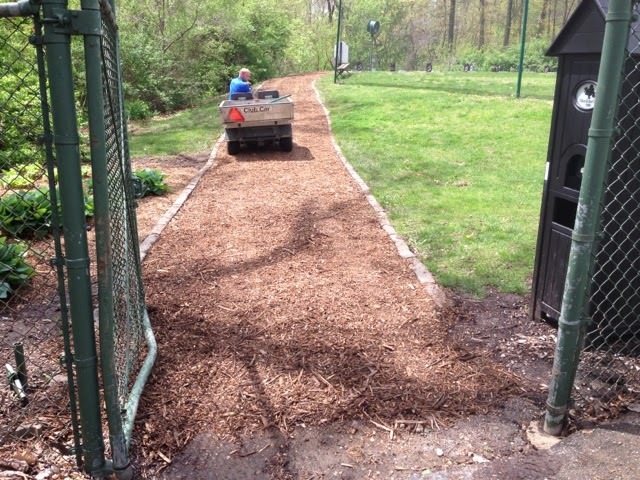 Straighten pavers and apply fresh free chipped oak mulch from our tree management plan. Final work project was pretty major. Digging out sunken area on main road bridge to determine why it was collapsing. 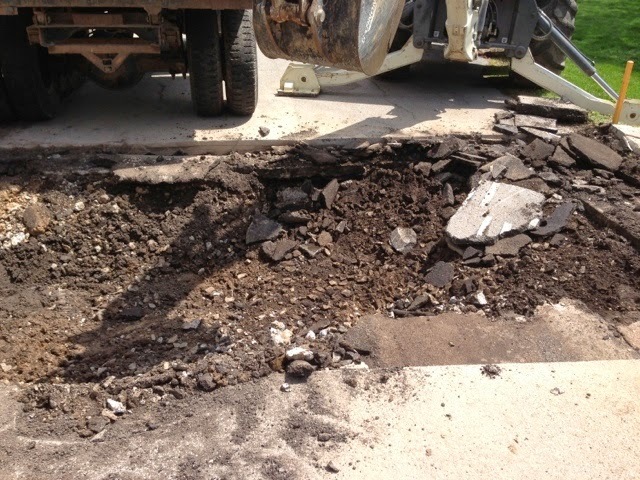 Sinking old concrete roadway was covered by 5-6" of multiple asphalt overlays. Will cover early and have road open by 11 a.m. Evaluating a couple of potential fixes for the 3- 22" drain pipes. Russ, Tom and Jason assisting Skip to open the bridge covering. Jason in the area where the old concrete was collapsing. About a 2' deep hole dug out in preparation for repair tomorrow morning. With rain coming in later today, I came into work this morning and sprayed our collars and edges of greens that are contaminated with Bermuda grass. The plants just emerged this week and protocol for Tupersan, the product we used says to spray at first emergence and then follow up every 4-6 weeks. It also needs to be watered in within 3 days to activate it in the soil. I had sprayed a preventative application earlier in the week of a product that protects the greens from some summer diseases and needed a few days between applications so the bentgrass/poa annua would not be injured. The Bermuda product inhibits the photosynthesis of the Bermuda grass and it will slowly begin to die. Of course as you know, Bermuda is a horrific weed. Its root system is fairly deep into the ground and braches out in many directions this the need for follow up applications. One of the unique benefits of Tupersan is that seeding can take place right behind an application. It is the only pre-emeregent product that is on the market that allows seeding. You can see the Bermuda in this picture off the back of 5 green collar with the long stolons that attach themselves to the soil surface. We are trying to injure it at emergence since it is weaker and more vulnerable and the chemical can create significant injury. Follow up treatments will insure that plants trying to creep into the area are kept out of the collars and greens. Sprayed a little over 7 acres of first cut of rough this morning in an effort to suppress some of the bermuda that has popped out in the last few days. This spray consisted of 1/2 of the product that I use on the fairways at a slightly higher rate. I sprayed Fusilade II around holes 1-3 and 13, 15-18. In most cases, it was about 30 feet but I did go a little further out in a couple of areas. The rough will turn slightly off its emerald green color for 7-14 days and will green back up. The bermuda should turn off color and then red but will come back in 4-5 weeks. If the bermuda would have grown out sooner, I possibly could have gotten a second spray before the heat of summer sets in. The product is not supposed to be sprayed on the cool season turf during summer. The second spray could also conflict with Member/Guest in mid-June. I will keep you informed if we decide to do another application. It can be sprayed again in the fall which we will do this year. After the rain stops this week, we will spray holes 4-5, 7-8, 10-12. This spray should give us some relief from the bermuda since we mow our rough between 2.5" to 3". I'll take a couple before and after pictures and post them later next week so you can see the difference in the color of the rough. The short range grass tee will open Saturday , April 26th!! A majority of our turf regeneration efforts are done in the fall with drill seeding close rough and late fall fertilization. 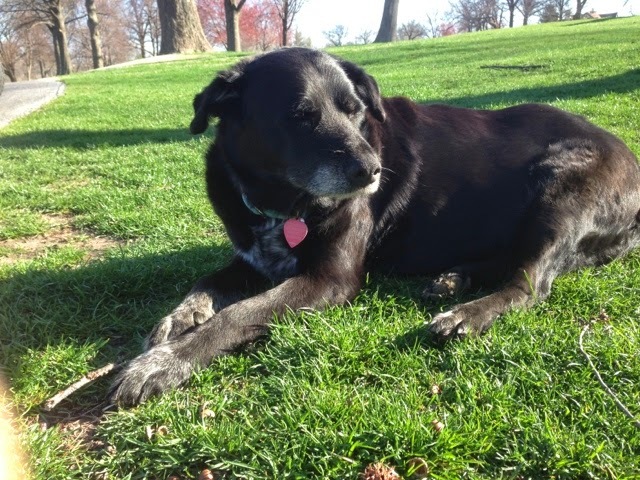 Once the turf awakens in the spring, we evaluate our progress and make plans for further renovation as necessary. We drilled 4000 pounds of a fescue/bluegrass mixture last fall into thinned rough areas. We began to use our renovaire aerator at the end of March to pull cores on all of the rough. That effort is still going with Skip closing in on the last two holes. Around he first of April, we over seeded a very large area on the left of #3 with Fescue. It has been drill seeded in the fall as well. This area is over burdened with shade and the trees out compete the weakened turf grass for available moisture. We will add a part circle head in this area which should increase the amount of moisture this area receives. Some root pruning of the trees should be helpful but there are 3 layers of trees in this area which reduces our ability to prune the total area. Seeding is very limited in the spring due to pre-emergent applications being made at the same time but the area on 3 is in deep shade so we made sure it was not sprayed. The area covered about 20 yds from the fairway to 12 cart path and about 50 yards long. The grass seed has germinated and is about an inch tall as seen in the picture below. A little patchy but our nemesis poa annua usually fills in the voids pretty quickly. The staff used almost 200 yards of sod behind 15 green and used another 200 yards of sod on stump holes and worn, rutted areas around trees. The delay in turf green up and subsequent rough growth has put our turf a couple of weeks behind. My first rough mowing of the year was a week later than last year. This week we are making sure the close rough is getting mowed twice before the rains set in. The turf is beginning to expand and grow and in most cases will fill in the voids in the rough. There are still some areas that will get some attention but in most cases there will be more than enough grass to swallow your errant shots from the short grass fairways and tees. Area on #3 that was seeded the first of April. New grass growing but existing turf that was there has filled in the area quite nicely with increases in temperatures and timely rain. A little tour of the greenhouse. Plant sale is scheduled for May 10th from 9-11 a.m. at the maintenance building which is below the first tee. Enough room to drive your cars down and park in our lot. Not sure of all the varieties that will be available but Becky should have a nice group of plants for purchase. Your account may be billed in the normal manner. As you might have noticed, we are not on the grass on the long range. I've been over seeding with ryegrass the east 1/2 of the tee over the last couple of years to get our weed population under control, namely poa annua and crabgrass. With the dry fall and very cold winter, the ryegrass is very sparse and the Patriot Bermuda is just starting to peak it's head out. 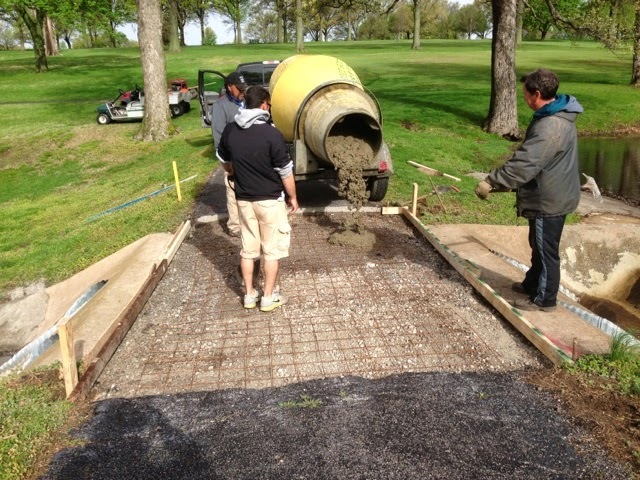 In an effort to speed up our growth and get the grass tee open, we are placing a permeable cover over 1/2 the tee. It will allow moisture and air to pass through but will hold enough heat to get the soil temperatures up and germinate some ryegrass and give the Bermuda a kick. In the meantime, we hope to open the short range zoysia tee by this coming weekend. 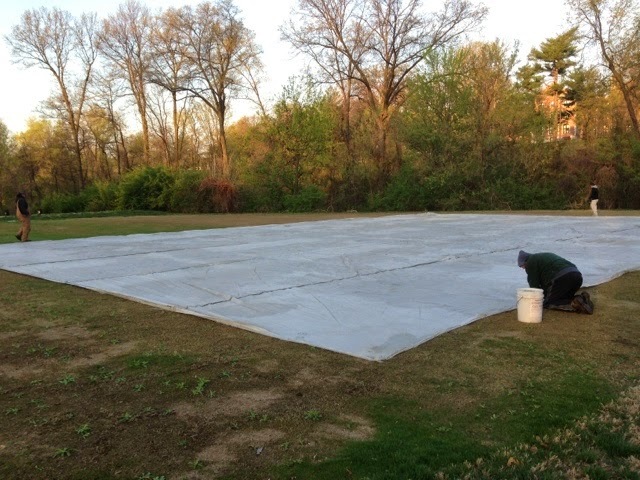 Permeable cover on long range. Today is designated as Earth Day, 2014. I've never been one to make a big deal of this day because I am involved with Earth Day everyday working on a great course like we have at Glen Echo. Hopefully, you will take the time over the next few days to come out and experience what we do on a daily basis in support of Earth Day. The staff used our verti-drain aerator to pull cores on our cool season tees today. The main tees on 2,3,5,10,11,14, and small tee on 17 are cool season. In a majority of the cases, excessive shade has created the need for these tees to be grassed using a cool season mixture. The aeration went about 5" deep. The machine has a drag that pulled the cores in a pile where the staff hauled the left over material away. We are dragging the tees, blowing them off, cutting them and will then put some granular gypsum and fertilizer on the tees. We will be applying a combination of compost and sand into the holes in the next day or two. Improved water penetration and will dry excessively wet areas such as #2 which has water running onto it from near the 17th fairway. The aeration holes themselves will capture, hold and slowly drain water into the soil profile making it more readily available for root systems during dry times. Topdressing the tees will help the surface dry quicker and will allow a tee to be placed into the ground more easily. Gas exchange, oxygen in, carbon dioxide out. Improved rooting into and around]the aeration holes. Below is a video of the aerator in action. Happy Easter and a few days late for the Passover Celebration. Course and club has been very busy since Friday. A sellout of members, guests and families expected at the club today! Made a video today to discuss the fairway bermuda eradication program.The zoysia grass is coming out of dormancy and in some cases where I sprayed bermuda grass, the zoysia that was mixed in the area is a little slow in greening. It is green but just not as green as the non-sprayed areas. Areas such as #1 from above the fairway on the cart path and #3 from the tee show the outlines of some of the areas where the sprayer was turned on and turned off. The video was taken from the flat area of #7. We are using a combination of Fusilade II at 5 oz an acre and Turflon Ester at a rate up to 32 oz per acre which has shown in university trials to increase the efficacy of the products than using Fusilade on its own. The zoysia is tolerant of these chemicals but can turn slightly off color during the application for the first couple of weeks. I would expect the remaining zoysia areas that are off color to be back to normal in the next couple of weeks. I apoligize ahead but toward the end of the video I must have been covering the mike so the sound does go down slightly so you might need to make an adjustment in your volume. We spend a great deal of time evaluating problems on the golf course based on scientific information. Sometimes the answers can be found in your front yard or back yard and only require observation and common sense. So goes the tree that was removed from the left side of #17 green. The staff were finally able to remove the trunk of the tree earlier this week. We could see a large cavity in the tree before the decision was made to remove it but was not sure exactly how deep it was into the tree. Well, we found out with its removal. Nearly 40% of the interior of the tree was gone. The tree had an expansive canopy, one of the largest on property and was only supported by about 60% of its trunk system. Paint gun is 3 foot long so the cavity covered almost 9 sq ft.
Take a look under or near any shade tree in your home landscape, especially a tree that creates shade in the early morning. In most cases a very poor grass growing environment, spindly, thin and many times non-existent turf grass. As you get out further from the trees center and begin to enter parts of the yard with more sun, the turf increases in thickness and overall quality. The same thing goes with a golf green that is severely shaded, and especially shaded in the morning which was the case with #17. Below are a before and after of the sun field that is now provided for the 17th green. The grass on this green is most appreciative of our efforts! 8:54 am in August. Look at the shade on this green. Deep shade on 17 green. Taken about the same time today. Realize there are no leaves on the trees but the sun is actually flatter this time of year and the green is almost in full sun. Carts will be off the paths and restricted to fairways only effective Friday, April 18th as long as the rain stays away tonight. Please follow signage which will direct you away from seasonally wet areas. Have Fun!! Today the staff poured the new flume or bottom of the spillway drain pipes at #15. The bottom of the galvanized pipes were rusting through and allowing water to potentially undermine the entire structure. We intend to resurface the bridge a week from Monday since we have an outing this coming Monday. 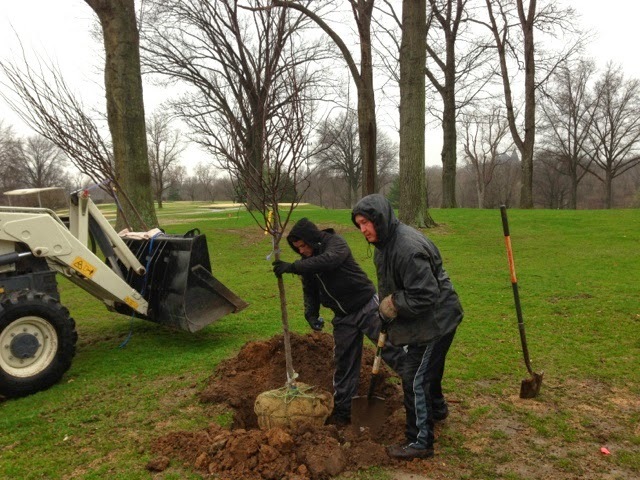 Over the last few days, the staff installed the four remaining trees that we had purchased for the course. 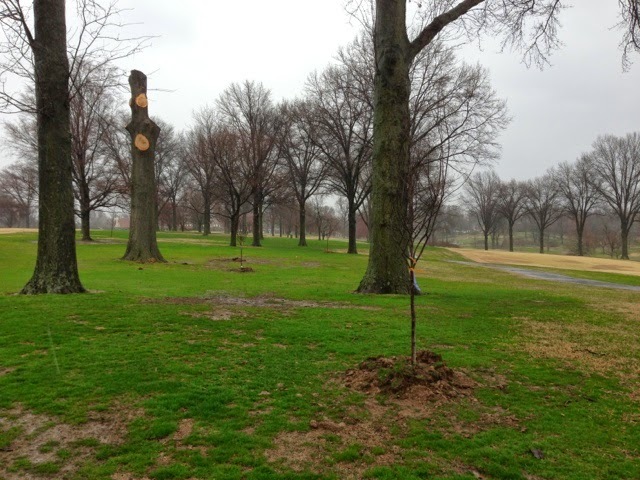 An earlier blog showed the installation of three Merlot Redbuds along #17. A Swamp White Oak was planted along the left side of #3 about 100 yards from the green. There is a large Ash tree that is aged and is showing some significant wear in the main trunk area. There is a second Ash below this tree that is not nearly as old but with the impending Ash borer invasion, we thought a large hardwood should be started before possibly losing these trees. The Swamp White Oak planted going up the hill on #3. The large aged Ash in the background that this tree is replacing. The Ash will be left in place until it dies or gets damaged by wind. The next tree up the hill is a large Pin Oak with a great shape. 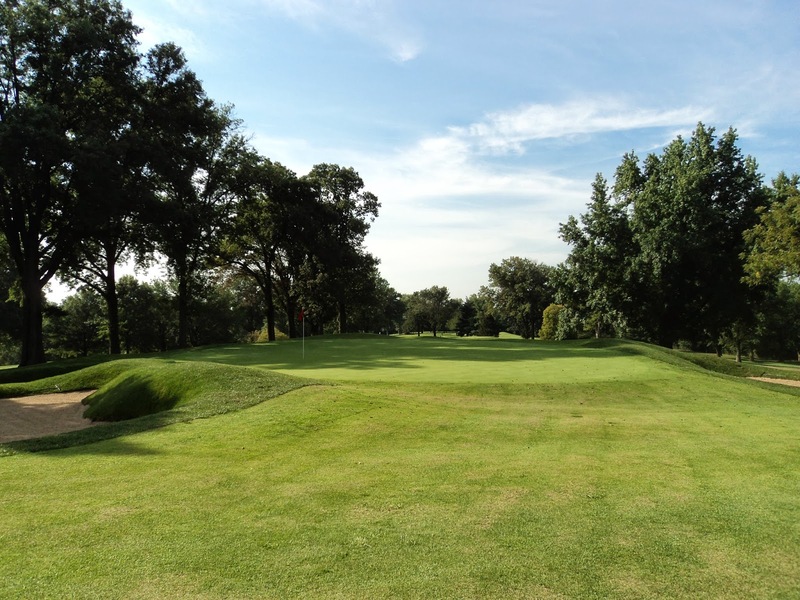 London plane tree was planted along the right of #16 less than 100 yards from the green just past the row of five Pin Oaks. The Pin Oak on the end has some severe damage to the crown area where it branches out. I believe a large limb out of the center blew off exposing it to additional insect/carpenter ant damage. I expect this tree will continue to weaken and will succumb to some wind damage over the next few years. In the meantime, the London Plane tree that we planted will grow and will fill in this area when the other tree has to be removed. We made some pruning cuts earlier in the spring but you can see the large damage in the V area that has been exposed and will subject the tree to more damage from pests. Becky and Skip adding a couple of stakes to this tree. Don't normally stake but its ball was not in the best of the shape so it needs some support for a year to help it establish. A Black Gum was the next tree that was planted closer toward 16 green just past the two large older crab apples on the right but it is set back and below the green and will not interfere with turf conditions on the green. 16 green is to the right for the Black Gum that was planted. The two older crab apples are in the background. The last tree is more of an ornamental variety but will give us good color in the club lawn and a back drop for #9 green. A Butterfly Magnolia was planted on the club lawn side of 9 green cart path . It will provide a nice display in the lower part of the club lawn, be visible to the main road and the 9th hole. The Butterflies Magnolia blooming in the club lawn behind 9 green. On today's episode of Mr. Wachter's Neighborhood members and guests,(boys and girls) we are going to emphasize a word SMOOTH and bury another word SPEED. With the fourth round and conclusion of the Masters Tournament, I thought it would helpful for all that I discuss a couple of words that at times are misunderstood(Smooth) in our great game and many times over used(Speed). For a couple weeks each year, Augusta National puts on a show that most of us could only dream. The ball roll is off the charts, every blade of grass is perfectly trimmed and millions upon millions of pine needles are laid out under the tall Loblolly Pines and Azaleas. This is a site that hosts one of the four major tournaments year after year and have a formula for success that is impossible match. 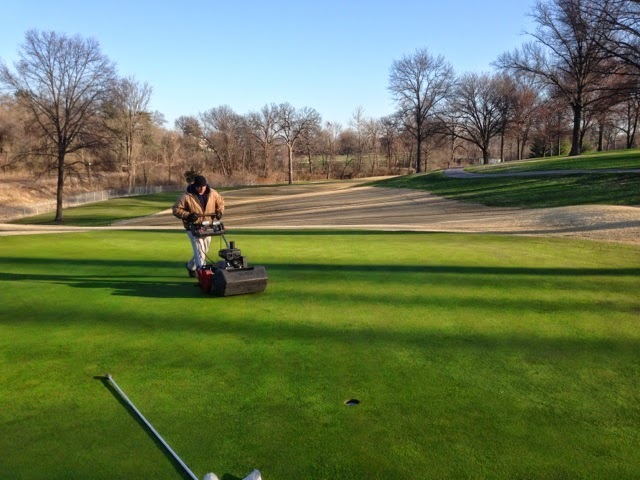 My efforts going into the 6th year at Glen Echo will be geared towards continuing to create smooth rolling putting surfaces that will have extended ball roll out when the conditions allow us to do so without severely compromising the health of our turf. At times, its a fine line to walk. We do many things to keep our greens as smooth as possible. Regularly topdressing with sand which helps to fill voids in turf canopy and keeps crowns of plants protected. Lightly brush greens to insure a good cut. Rolling greens on a regular basis. Fertilize slow and steady to keep consistent growth with no flushes in growth except at aeration time to fill in holes. Use growth regulators to keep the poa annua from out growing the bent grass. Proper watering to keep surfaces drier which reduces ball marks and spike marks. Decrease poa annua seed heads in spring using chemical treatment. One of the things that I have to do as a turf manager is to curb my enthusiasm at times in regards to ball roll out. Everyone including yours truly gets a little over excited hearing about faster ball roll out. If ball roll out becomes excessive, hole locations become limited. A couple of locations I placed in yesterday's Opening Day could attest to that if you were on the wrong side of the hole. Extra ball roll leaves sometimes only 1/3 to 1/2 of a green that can accept a hole location which places added stress on this area of our already smaller than average sized greens. 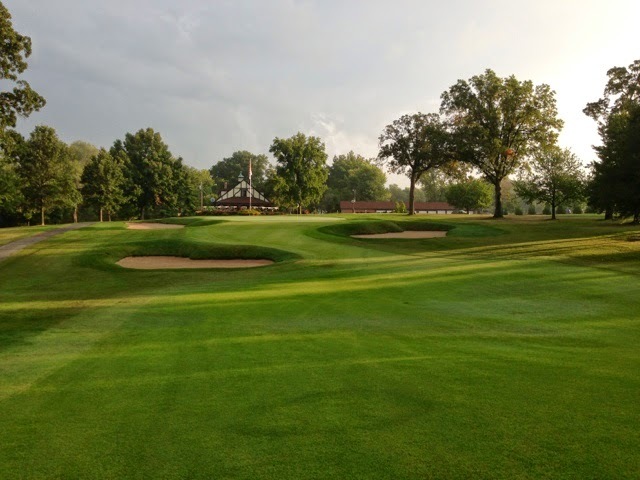 New putting surfaces were grown in at Glen Echo in 1995. The turf on our greens is only 19 years old but many of our greens themselves are 80-113 years of age. No drainage and only a 4" cap of sand on top of the original playing surfaces. The infrastructure alone makes it most difficult to achieve extended ball roll conditions for an long period of time. A ball roll that will stay on track smoothly to the hole without deviation and adequate roll out if you strike it with the proper strength/touch and spot to insure it gets in the hole. Enjoy your day at Augusta and the rest of the golf season. The staff did some early morning jobs today getting course prepared for play but the rest of the day was spent laying about 300 yards of Fescue sod in a number of areas. 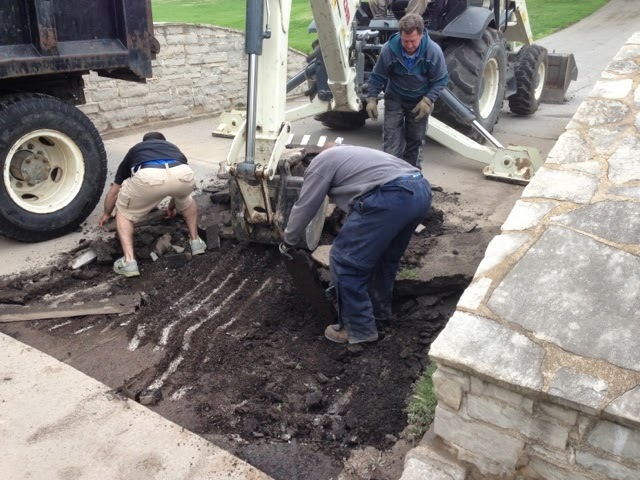 The largest area was the repair of the area behind 15 green which had two trees removed. The grinding of the stump areas plus bare and or weakened turf area covered approximately 165 sq yards which is approximately 1500 square feet. Surface roots were removed, old sod remnants were stripped up and the soil was graded and moved around where needed. Big roll fescue sod was laid and it was watered and roped off. All newly sodded areas should be played as ground under repair over the next few weeks until the sod fully heals. 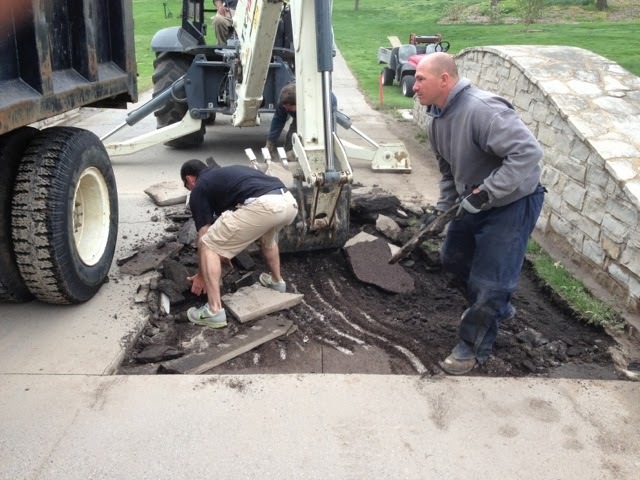 Skip and Jason loading the old sod remnants from behind the 15th green that were stripped up by Randy with a sod cutter. The area graded smooth and ready for sod. The area was fertilized and then sod laid with big rolls of Fescue/bluegrass. The staff pulls the sod lines together by hand which improves healing time. The big roll is 40" wide and approximately 95 feet long for a total of 315 square feet. Big roll sod can allow you to open the area for play much quicker than regular pieces of sod. There are less seams which shortens the healing and growth time. The area completed behind #15. View fro #13 tee. The sod is still a little off color but should begin to green up pretty quickly in the next week. As you can see from the mid ground to the foreground, a lot of Bermuda grass contamination all around this area. The staff also worked on a number of other ground stump areas which required some extra soil and were then sodded. 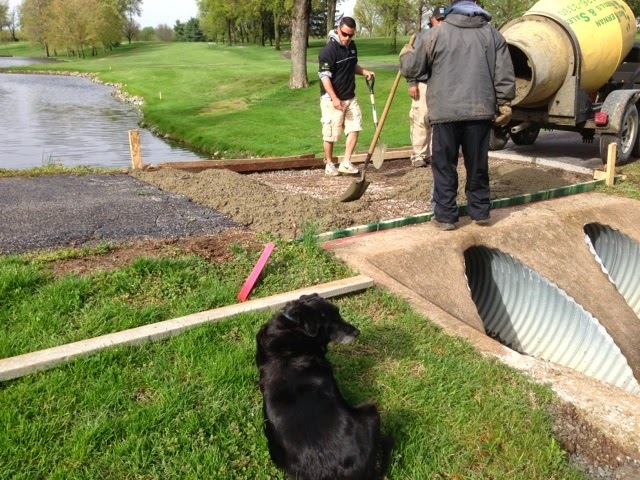 Also the drain project from late last fall was repaired as well on #12. We still have a pallet of sod which will be used for additional repairs that were not completed today. We also installed the remaining 4 trees that were purchased last week for planting. I will have pictures and profiles of the trees in the next couple of days when I can get their pictures taken. After mowing greens this morning, part of the staff spent the rest of the day clearing a large amount of leaves that accumulate over the winter along our fence lines. They hand rake and use backpacks to blow the leaves in rows so that another staff member with a tractor and vacuum can then come by and pick them up and haul them to our dump area. They were able to get a large portion of #4 completed and started on part of #3 because the winds changed direction. This normally takes 3-4 days to complete the entire perimeter of the fence line of the property. If the leaves are not picked up, they will kill grass along the fence rows, make it difficult to locate a stray golf ball and can also be blown back into play areas when the wind blows in the right direction. Jason picking up the rows of leaves along 3 that Jeff, Randy, and Sam blew away from the fence. Skip, Russ and Tom worked on the 15 bridge/spillway project today. A couple of portable mixer loads of concrete were placed underneath the 15 bridge spillway to shore it up and stop the scouring of gravel from underneath the structure. The guys mortared some cracks in the upper part of the spillway to reduce leakage underneath the structure. We plan to place a new concrete roadway on the bridge, preferably a Monday in the next couple of weeks. Still have to talk with Skip about the concrete flume work that I originally had discussed. Skip, Russ and Tom pouring the concrete through the hole cut in the lower spillway. You can see the boards in the foreground and background that were used to prevent the concrete from coming out from underneath the structure. I sprayed greens today with our seed head suppression product that I discussed a couple of weeks ago. The requirements of the application are that you spray it no later than 21 days after the first application. I was 1 day on the back 9 and 2 days early on the front 9 but early is better than late. I was concerned with a potential report of rain overnight and with Men's Opening Day on Saturday, did not want to be late with the application. It appears our application is working but we still have not reached the peak flush for seed heads which should occur in the next few weeks and last for at least a couple of weeks depending upon the weather. During the spraying today, 17 green was one of my last greens to spray. I took a picture below of a bunker that was not raked. What was most surprising to me was that all three bunkers appeared to be not raked and all had foot prints in them. Please be aware that bunkers are not raked every day and if you leave your foot prints in a bunker, players behind you are potentially left with a difficult shot if their ball would fall into a foot print. Please be considerate and rake the bunkers after you use them. Interesting, a majority of the other bunkers were raked properly. The right bunker on #17 that was not raked after balls were hit from it by what it appears to be at least two different foot prints. I don't pay a lot of attention to the number of posts I make each year. Since February 2009, I've tried to keep the posts frequent enough to keep your interest in this great golf course and at the same time keep you informed of our work that is being performed on a daily basis. I know many of you read it on a regular basis because you see me at a function and tell or ask me about a particular post. The use of a smart phone which is how I'm making this post today has allowed me to make many short, one paragraph and a picture post from the field which saves both the you the reader time in your busy lives as well as yours truly. I truly believe in this resource that I provide to you on a regular basis. I take great pride in this blog and believe its one of the most important parts of my job. Thanks for your support and I hope I can continue to provide information on the blog which you find interesting and informative! It's that time of year when many firsts occur. Today is one of those days. The staff is beginnings the the millions of steps and the thousands of miles it takes to walk mow our greens and collars. We will walk mow a majority of the days with a day per week or so using the riding mower depending upon our work schedule. Rolling greens with our riding mower vibratory system will occur 3-4 times per week. When we use 4 staff members to mow, it takes a little over 2 hours to mow 2 acres of greens. When 3 staff mow, it takes about 2.5-3 hrs to mow the greens. Jason walk mowing #1 green. We are still a week or two away from allowing carts off the paths for the season. The zoysia must green up enough and be mowed for the first time before I allow carts off the paths. The driving ranges also will remain on the mats until sufficient growth occurs so they will begin healing once divots are taken from the surface. The overseeded section of the long range(right half) has been really slow in growing out of its winter freeze and the overall tee is extremely wet. I would hope to open this part of the tee once there is sufficient drying to reduce excessive damage. A little fertilizer and some warm days should give the ryegrass over seeding a little kick in the pants. We appreciate your patience as we transition into our spring season. As you might have experienced over the years, the Field Bar can be a very windy and cold place during early spring and late fall. In the past couple of years, we have attempted to place some wind protection over the openings to the buildings. It was a good thought but not the most attractive and or effective endeavor. 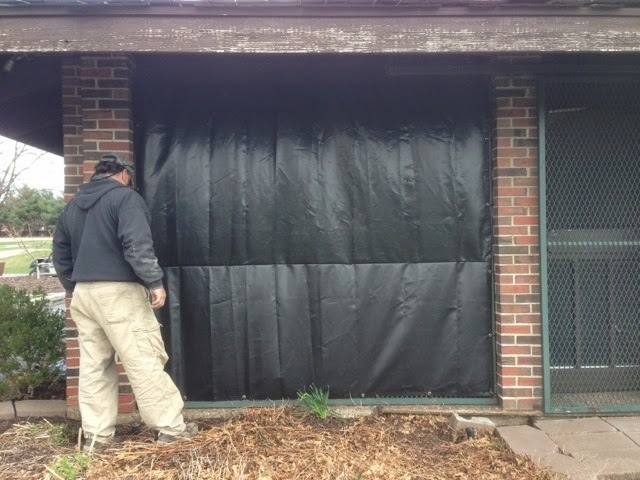 This season, we contacted a company and ordered custom sized black screens made which will reduce 90-95% of the cold north wind from entering the building. The staff began the installation today and will complete the 8 tee and 10 green side of the building since this is the direction that the cold wind originates a majority of the time. The screens will be removed in mid to late May and installed again this fall. The bridge/spillway leading from 15 tee to 15 fairway is in need of some significant repairs since the excessive rain last week. The gravel under the spillway leading to 15 lake has been scoured out over time and the roadway/asphalt experienced another collapse. Today, we ripped off the asphalt covering to the bridge and cut a hole in the concrete spillway to check how much of gravel has been eroded from underneath the spillway. Our plan is to pour concrete under the spillway to reinforce the spillway and protect from future erosion. The upper part of the spillway needs some patching and the rusted bottoms of the galvanized spillway pipes will receive the same treatment we did last season to the spillway between the two small lake on #10. We will cut the rusted section of the pipe and place a new concrete flume bottom so the water will travel through the spillway and empty into the lower lake. Our last task will be to place a new concrete bridge surface for carts and walkers to cross the area. In the meantime, please use caution when crossing the bridge by foot or by cart. This work should take a week or so depending upon rain and lake levels. Skip removing the asphalt covering of the bridge on #15. 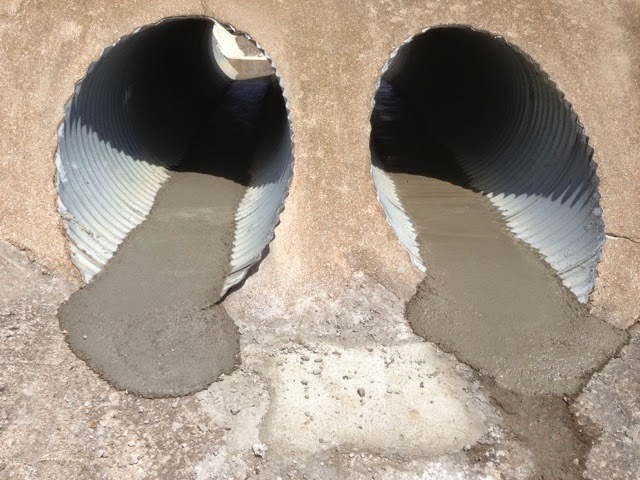 Once repairs are made to the galvanized spillway pipes which have rusted bottom and repairs to the concrete spillway, the bridge will be resurfaced with concrete. A check hole was cut in the lower section of the spillway so we could see the damage. We plan to pour concrete into the area to stop the eroding that is taking place under the structure. You can see to the left the rusted galvanized pipes. The rust areas will be cut out and a new concrete flume will be installed to move the water between the two lakes. 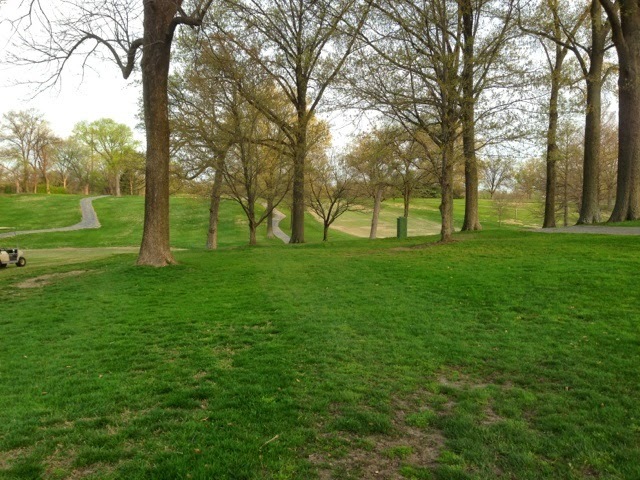 A majority of trees that should be planted on a golf course are of the non-ornamental variety. We broke the rule today when the staff planted 3 Merlot Redbuds between 16-17 this morning before the rain stopped us for the day. As you know, we removed a couple of large oaks to the left of 17 green to get early morning light on this green. A perfect spot for an ornamental in an area that receives very little play but would provide great viewing of this nice ornamental tree. Additional trees will be planted in other locations later this week if we are not too wet. Additional reading on this cultivar below. Russ, Tom and Skip planting a Redbud in the trees to the left of 16 fairway and the back left of 17 green. The tree in foreground is what the guys planed in previous picture. Toward the tree that must be removed is the 2nd tree the guys planted. The 3rd is in the background near the Pin Oaks. Becky went and picked up 7 trees that we intend to plant on the course next week since Noah and his arc arrived at the course today, I will give you details of the varieties and their locations in the next few days. Our carts are entering their 6 season as I am and they need a little rejuvenation just as yours truly. I get some rest in the winter and they see very little use themselves but this winter was very difficult for a little over 1/3 of our fleet. 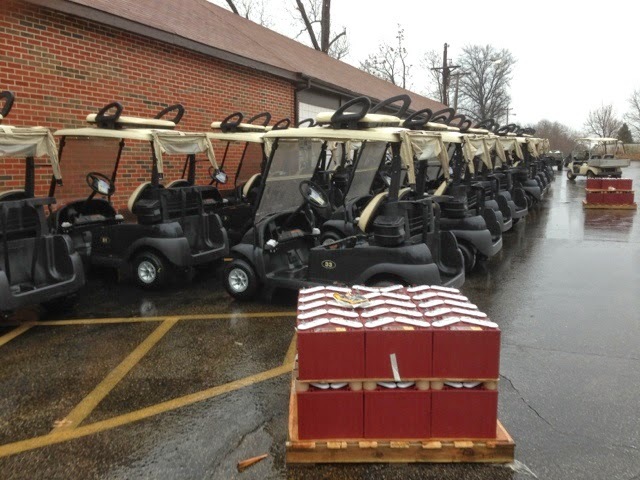 Last season, we replaced 30 carts' batteries. I expected we would have to replace the rest of the batteries sometime this season since they had survived past their normal life. With negative double digit temperatures, excessively aged batteries, and an unheated cart facility, many of the oldest batteries froze. Today, our staff had to replace 24 carts' batteries. We have 6 carts with a few very old batteries that are still holding charge, and some newer 2-3 year old batteries that were strong enough to survive the winter. The staff spent the day replacing the batteries that were depleted, cleaning terminals on the year old batteries and checking/filling water levels to insure they will continue to operate efficiently this season. Our mechanic Dave is responsible for the main maintenance of our 60 carts and their chargers. He's improved the overall maintenance of the carts since he has arrived last May. The rest of our staff including Barrett and the pro shop staff have also assisted in keeping the fleet in good shape. David has spent the last week checking tire pressure, steering, brake systems while removing, testing, and attempting to revive the units that were repaired today. During the season, please inform Barrett and Abby if you experience any issues with a cart so it may be written up and checked by Dave. Pallet of batteries waiting to be installed. 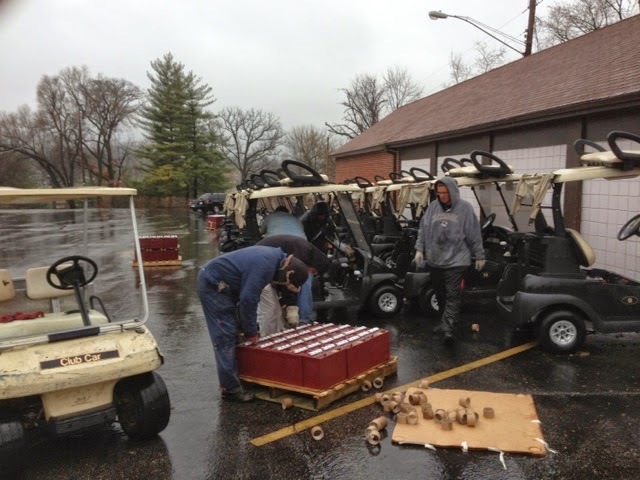 The staff loading batteries into carts and installing hold downs and battery cables. Our work was interrupted by mucho rain, lightning and hail on multiple occasions. We were ultimately forced into the maintenance building to complete the work.